Personalized Neoprene Bottle Koozies -Holders in Bulk. Promotional, Inexpensive, for 16-24 oz. Bottles. Budget Prices for USA, Canada. Bulk Neoprene Bottle Holders - Insulators with attachment clips, for 16-24 oz. bottles. Our bottle insulators are provided with an attachment clip (see picture), a drawstring with cord lock for a secure bottle fit. We also supply blank (not imprinted) Neoprene Bottle Holders at EQP (End Quantity Price). Budget Prices in USA and Canada for bulk customized Neoprene Bottle Holders . Free artwork design. American clients pay no taxes. 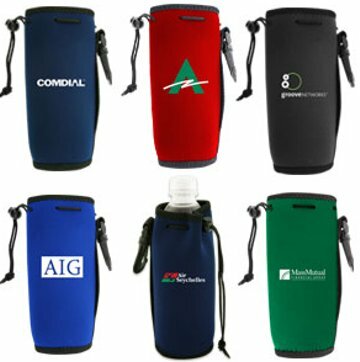 Our personalized neoprene bottle koozies are great for promoting your business or used for a corporate give away. You can also use them for weddings, birthdays, picnics, family reunions, parties, grand openings, class reunions, cook outs, sporting events, etc. Unit prices below include 1-color custom imprint on one side. Add $0.15 per neoprene bottle koozie for 2nd side imprint if same color & screen. 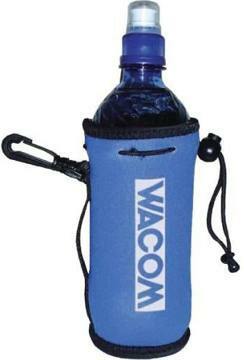 We also supply blank (not imprinted) Neoprene Bottle Holders at EQP (End Quantity Price). Ships in 5-7 Working Days After Art Approval. -Imprint Area: Side: 3"x4", Wrap: 6"x4"
-Colors: Black, Brown, Burgundy Red, Forest Green, Fuchsia, Gray, Kelly Green, Mix Camouflage, Navy Blue, Neon Blue, Neon Green, Neon Orange, Neon Pink, Pale Pink, Purple, Red, Royal Blue, Turquoise Blue, White, Yellow. - Printing Process: Screen printed. - Clip for attaching to golf bag, beach bag or backpack. - Holds 16 to 24-oz. water and soda bottles. - Packaging: Bulk; 100 kooziwes per carton of 11 lbs.